Greetings readers! 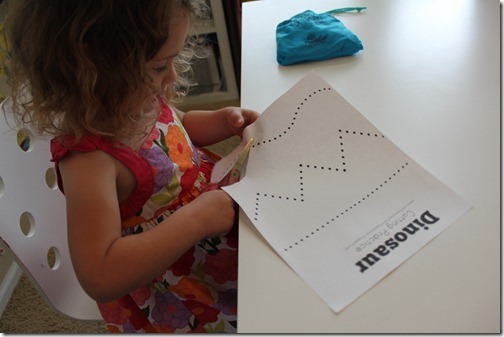 I have a Teeny Tot Tuesday post for you today, and we’re working on the Letter D for Dinosaur! Coloring: Even though I absolutely LOVE our school room, it’s kind of nice to get a change every now and then. 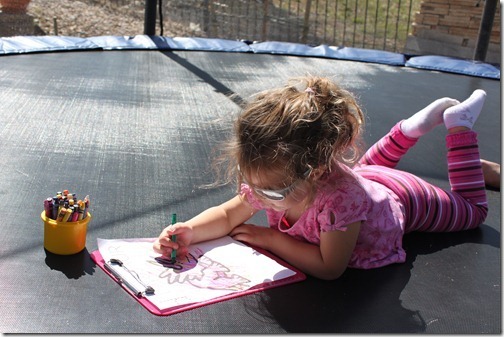 And since it was so nice out this week, we decided to change it up a bit and do a little “trampoline” school…that’s where the kids get to take their work out and lay on the trampoline and do it. It was a little bright out so the Teeny Tot dawned her sporty sunglasses and got down to business coloring her dinosaur. 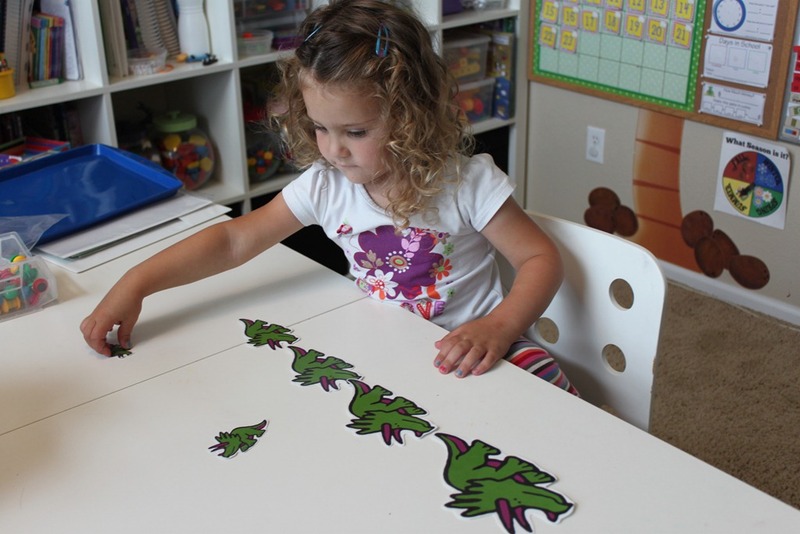 Counting Skills: I brought out the dinosaur number cards for her to play with today too. I used them with my Learning Resources Math Links, and had the Teeny Tot put on the correct amount of links on each dinosaur. She also color coded them which I thought was nice. 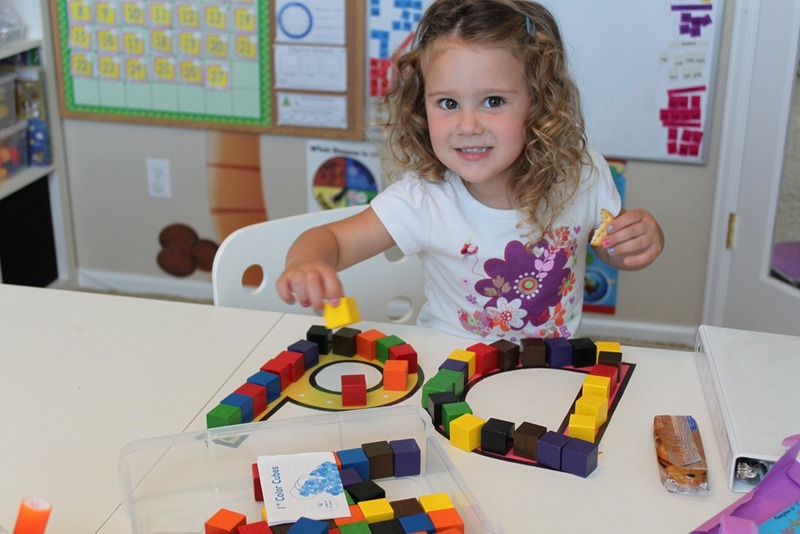 Letter D shapes: Today I pulled out my Large Letter D print outs and had the Teeny Tot make a pattern using Learning Resources Color Cubes. 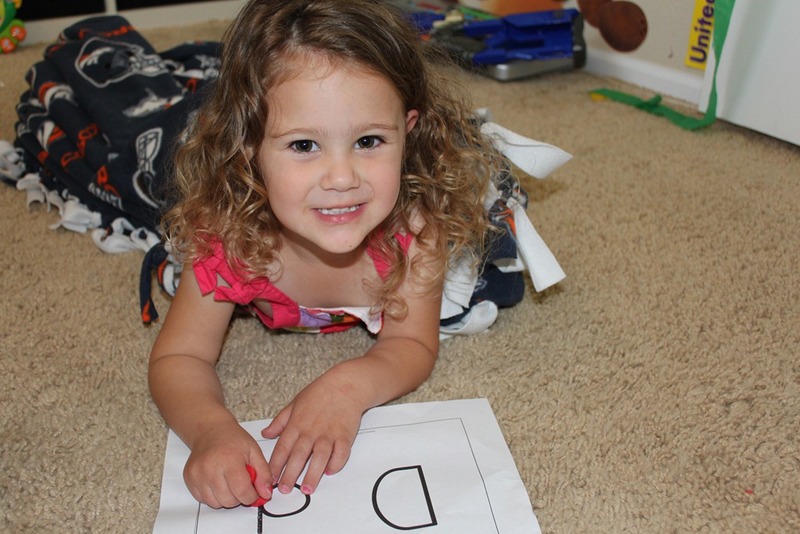 Okay, she was supposed to make a pattern, but just ended up putting blocks along the letter shapes which was fine. 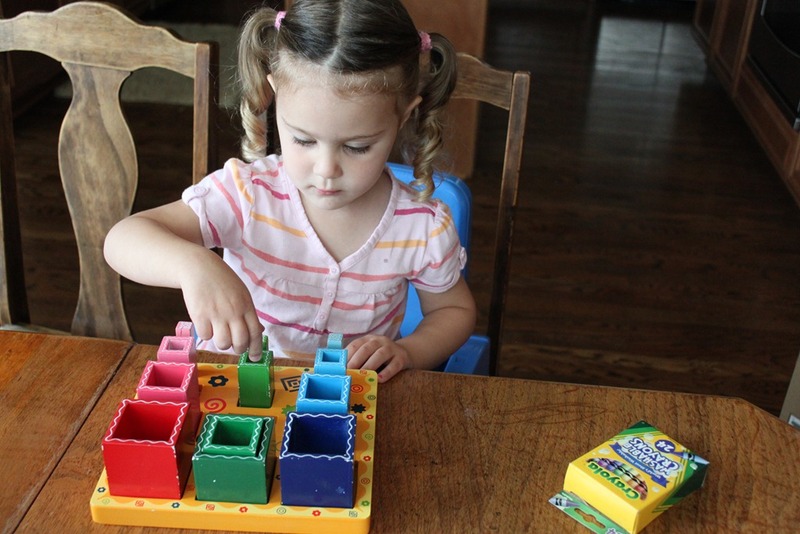 Since we already had our Learning Resources Color Cubes out, I went ahead and tried some of the easier Creative Color Cubes Activity Cards with her. I had to help her a little, but she seemed to catch on pretty quickly. 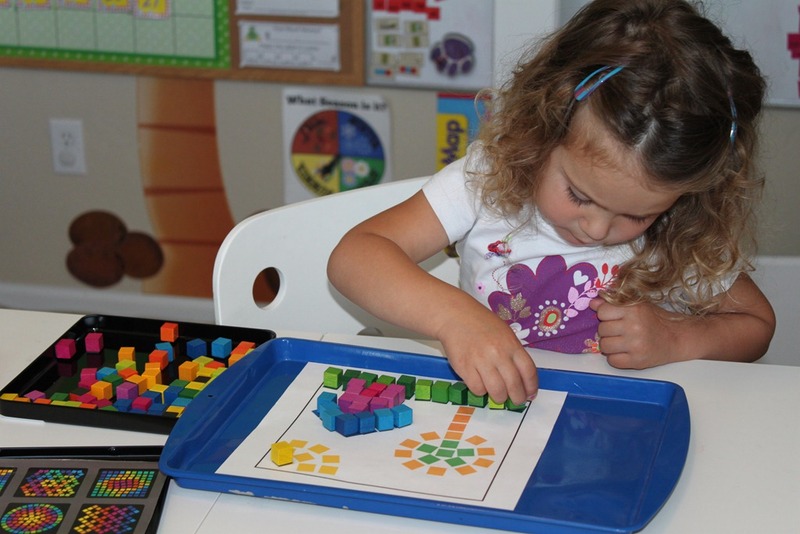 These games are great for logical & spatial skills! 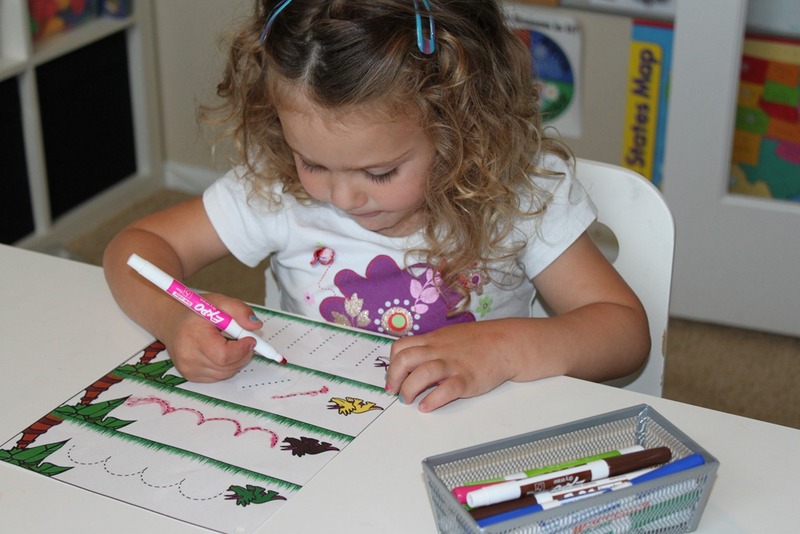 Pre-Writing Practice: I laminated my pre-writing pages and then the Teeny Tot used dry-erase markers to practice tracing along the pre-writing shapes. 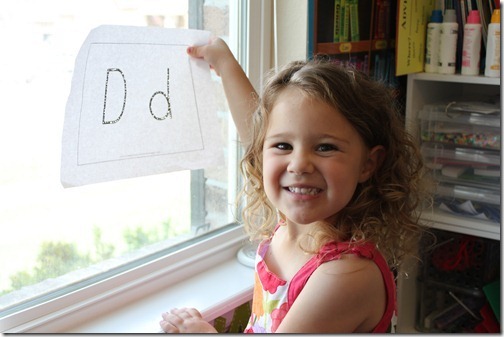 This is excellent practice for the handwriting that will come later on. Click here to download the Magnetic Color Cube Cards. 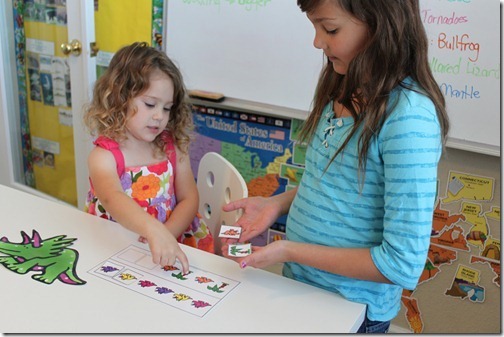 Magnet Page: This activity is great for one-to-one correspondence. We use them with the small round Power Magnets, please be careful with them though as they’re surely a choking hazard! 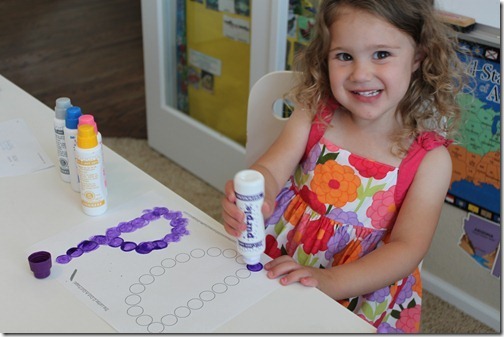 We also use them with our pom-pom magnets which are fun and easy to make, here is a great tutorial from Mama Jenn. Size Sorting: Next up was our Dinosaur size sort. She didn’t particularly want to do this one, so I told her we could do the Large Floor Numbers after she did the sizes. 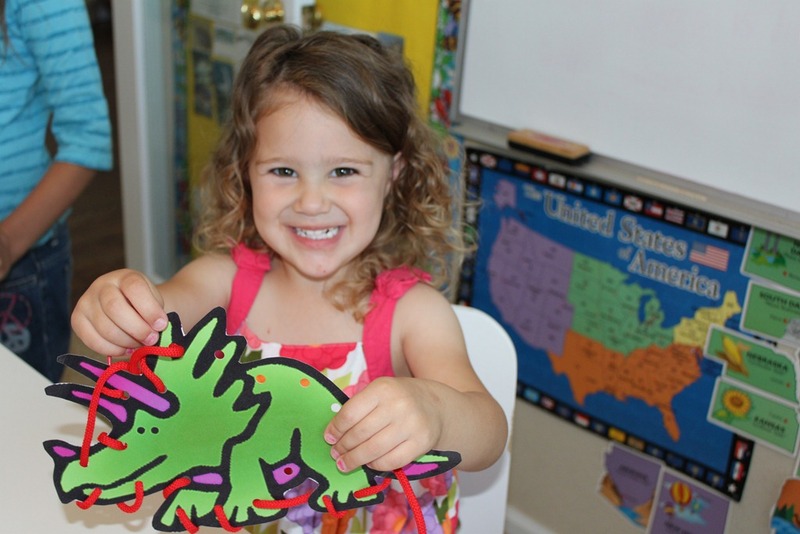 It seemed to appease her, so she did her dino’s. I told her to get the biggest one first, then the next biggest, etc. After she was done I had her point to the biggest, smallest, and medium dinosaurs. Then she counted to see how many she had. 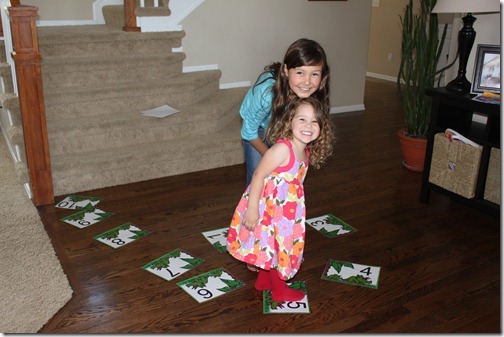 Large Floor Numbers: As promised, her large floor numbers were up next. She loves this game, probably because she gets to hop all around. We lay them out in order usually, then call the numbers as she steps on them. It helps with number recognition. Later we’ll call a number and have her hop to it, but for now it’s easier for her to go in order. 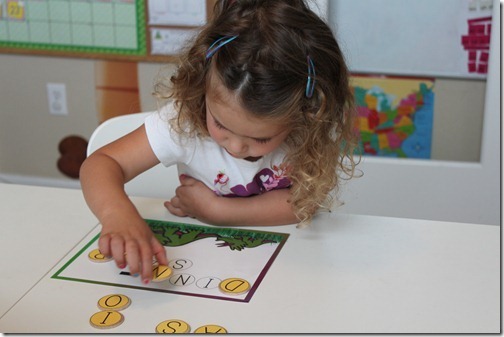 Letter Matching: This game is great for letter recognition, once she gets used to the capital letters, we’ll make it a little more challenging and have her match lowercase letters to uppercase letters. Do-A-Dot Activity: She also worked on her Do-A-Dot page with our Dot-A-Dot Markers, she’s actually getting really good at keeping the dots in the actual circles on the page…previously she’d do a few dots, then proceed to cover the entire page with different color dots! Nesting Blocks: Next up, and not really related to the Letter D, but she got out our Guidecraft Nesting Sort & Stack Cubes. These are fun, they can build towers, sort by size and color, and since they’re hollow then can stack or nest the blocks. Lacing Activity: Next up we have our lacing card, I still haven’t figured out why, but all of my kiddos have loved this activity. As a matter of fact as soon as the Teeny Tot is done with her lacing, Turbo always snags it and does it himself. Waiting close behind is Tinker Bell. 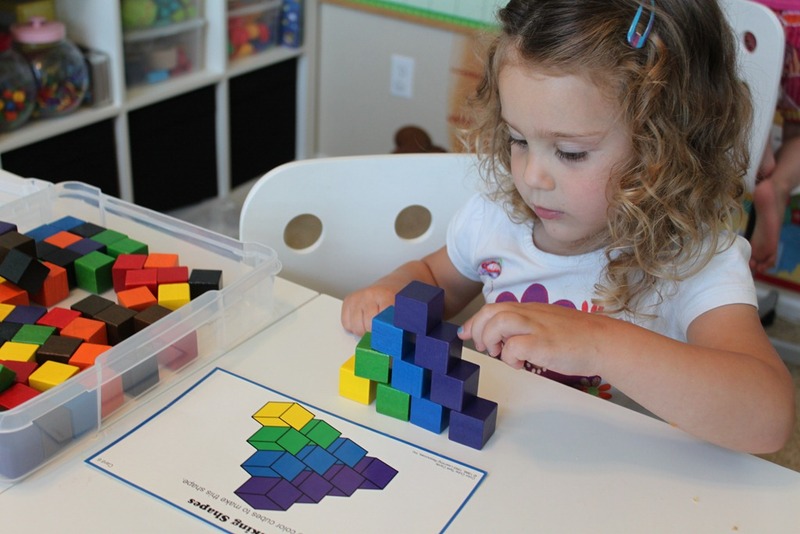 Pattern Activity: The concept of a pattern is still a little beyond the Teeny Tot, so Strawberry Shortcake calls out the items for her and she picks what should go next. It seems to work pretty well to do it together for now. 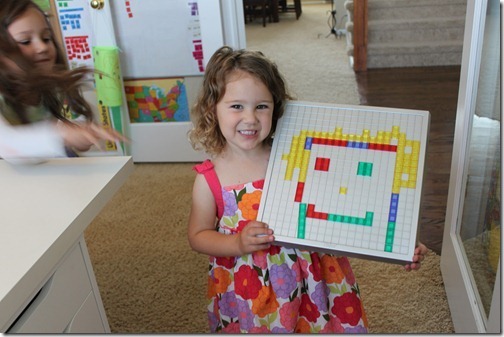 Blokus: This was a request by the Teeny Tot herself. 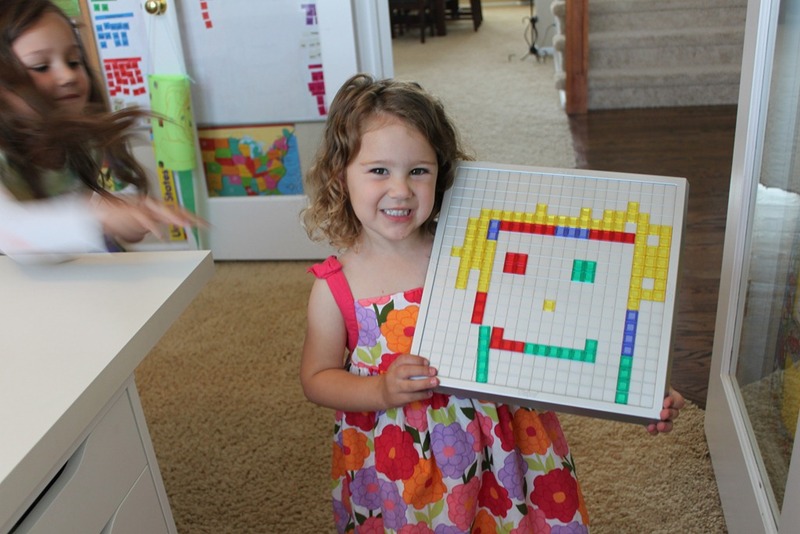 She got out our Blokus game and made a cute face using the pieces. It’s easy to use it like a puzzle for the Teeny Tot, and also a wonderful logic game for older kids. 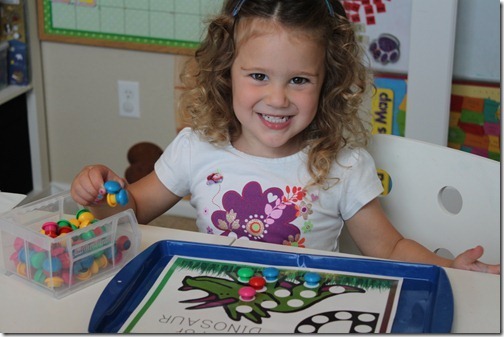 Poke Page: I found this HUGE push pins at a Target and we use them for this activity all the time. They are sharp, but she knows to be careful. Her goal is to poke little holes along the letter lines. It’s great for fine-motor skills, patience building, and also letter recognition. 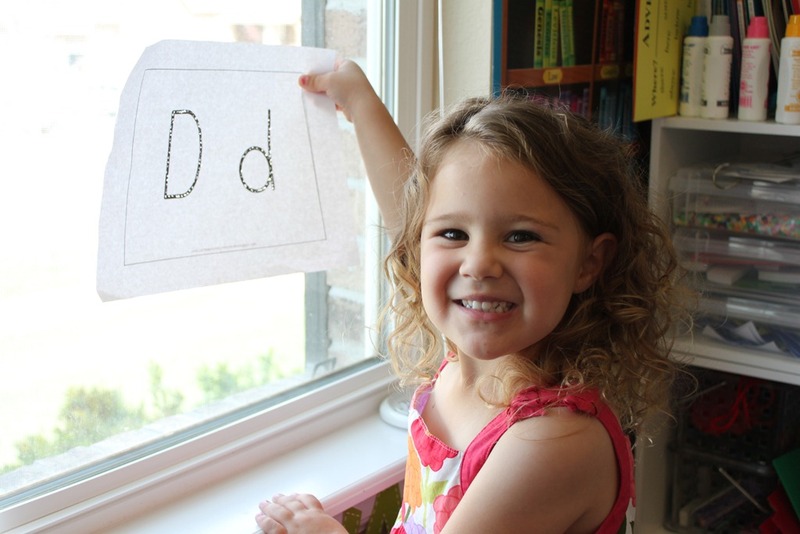 She sings “The D says ‘d’ the D says ‘d’ every letter makes a sound the D says ‘d’” as she works on it. After she’s done, she gets to hold her poke page up to the window and see how she did! An excellent job if I do say so myself! 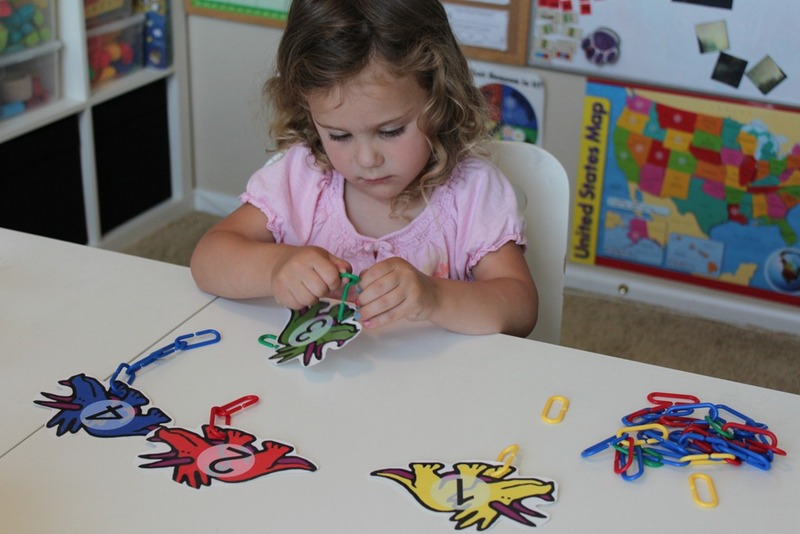 Scissor Skills: The Teeny Tot absolutely loves to cut things up. Previously she would cut her scissor skills pages into a billion tiny pieces, so I was very pleased today when she actually cut along the lines quite well! And that’s it for today’s Teeny Tot Tuesday post! 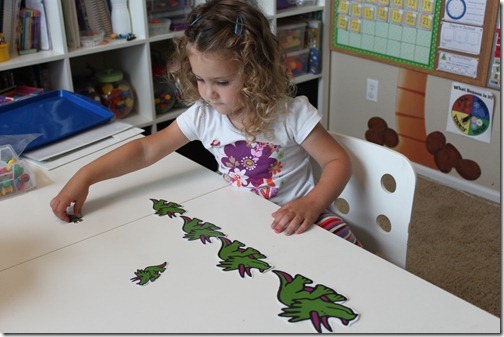 This is just a SMALL portion of our Letter D activities, you can download all of my Letter D for Dinosaur activities free, or you can also grab the whole Letter of the Week curriculum. Love that top pic of her working hard on the trampoline. What a perfect spot!! And on of these days I will get my hands on those magnetic colored blocks. I just love those and don’t have any! Thanks so much for tot Tuesdays. 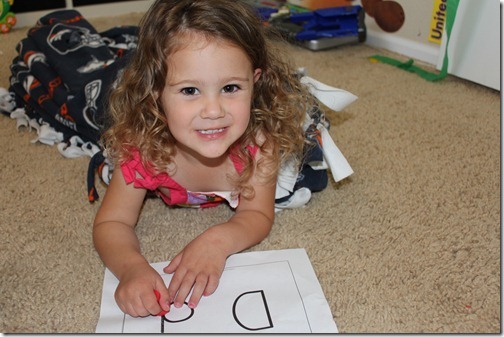 These are my favorite posts – I get so many helpful ideas for my tot who is only 22 months. I am always amazed at all the activities that the ity bitty ones cans really do. Thanks again. I’ve told you before, but we LOVE all of your preschool printables!!! Use them every week, and printing more as I am able. Hope to be able to buy the expanded set soon! You’re great! We have also been doing “tramp” school, makes a fantastic place to hang out and do school 🙂 The kids love to take their reading out there. Awesome, we have those magnetic cubes. Those cards will be great to use with my little guys, thanks! Oh my word! So cute! 🙂 Downloaded your LOW (Letter of the Week) pack and love it!!! Hi! I love all the great things that you do with your children. Thank you so much for sharing everything that you do, they’re great ideas. Can you tell me where you found the dot-a-dot pages, I’ve been looking for them and can’t find them.